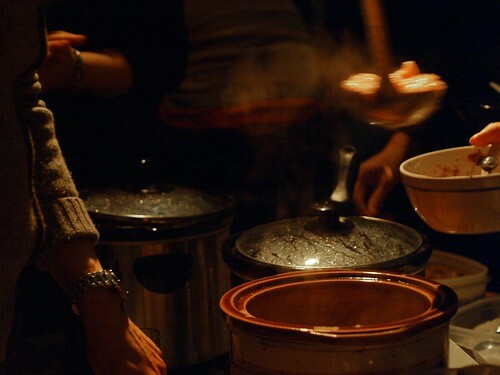 Earlier this week, I joined a handful of other Chicago cooks at the Hideout for the weekly winter Soup & Bread event. It was a full house and we helped to raise $400 for the Franciscan Outreach Mission through donations. Thank you to everyone who came out! I made a Chipotle & Cumin Black Bean Soup (recipe below). It was a delicious night. Check out the Soup & Bread cookbook and if you live in Chicago, be sure to stop by one of the upcoming Wednesday night events. A big thank you to Martha Bayne and the Hideout for continuing to organize events that benefit local and international organizations. In a second large pot, heat the oil over medium-high heat and add the onion and bell peppers. Cook until tender and beginning to brown, about 8 minutes. Add the garlic, cumin and chiles and cook for 1 minute. Add the prepared beans. Cover and allow to simmer for about 20 minutes. Season to taste with salt and freshly ground black pepper. Stir in the lime juice. Serve with sour cream and cilantro to garnish. *This soup is spicy. Reduce the chiles for a milder soup. **Beans can be prepared a day or two ahead. Allow to cool at room temperature and store in an airtight container in the refrigerator. 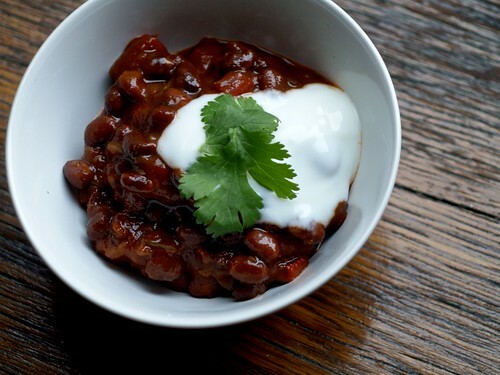 If you prefer to use canned beans, substitute 7 to 8 cups. Do not drain.